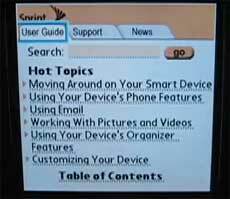 Somebody got their hands on a Sprint Treo 700p and I’m very jealous… However, at least they were nice enough [Thank you very much David] to shoot a very good – 16 minute long – overview of their experience on video to share will all Treonauts… Below are some of the screenshots and my take on it. 1) As most Treonauts will already know, the Treo 700p running PalmOS is mostly identical in hardware design to the Treo 700w running Windows Mobile with one of the main differences being that the ‘p’ benefits from a 320x320 resolution screen while the ‘w’ has a 240x240. 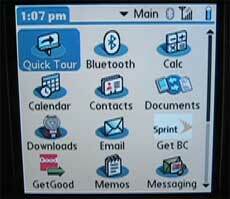 2) The Treo 700p already comes with a number of new and enhanced applications and Sprint further adds a few unique ones of its own – particularly strong on the multimedia front. 3) As the Treo continues to evolve and get even better with each generation so does the relative complexity of using the smartphone for completely new Treonauts. To help people get up to speed faster Palm has somewhat enhanced its ‘Quick Tour’ application as well as adding a ‘MyTreo’ one with an even more in-depth user guide. 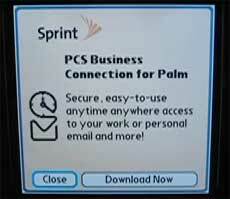 5) PCS Business Connection for Palm is one of the Sprint applications pre-installed in their version of the Treo 700p. 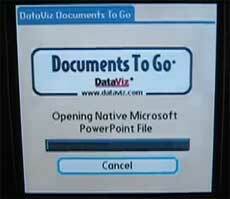 I have not previously used this but it appears to be very similar to the service provided for free by Avvenu for remote document access. 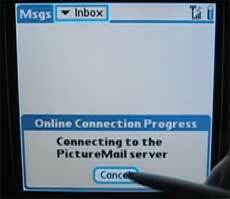 6) A new functionality within ‘Messaging’ is called ‘PictureMail server’ but I’m not quite clear as to what functionality or service this adds yet. 7) One of the applications not shown or tested in the video is the ‘GetGood’ icon. 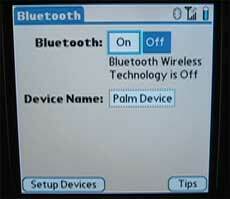 This will allow you to automatically set a trial to the GoodLink service that many Treonauts swear by and which continues to grow and be refined as an excellent alternative to BlackBerry Connect (which should also soon become available for both the PalmOS and Windows Mobile Treo in the US). These GoodLink bundles, will be available for $40 a month for up to 5MB of data and $50 for unlimited data and also include DUN service (for the amount of data in the bundle) and wireless data connectivity. 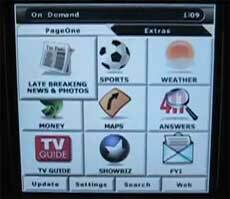 8) One of the applications labeled ‘On Demand’ is actually Handmark’s very good ‘Express’ news and information service which is now one of the pre-installed programs on the Treo 700p. 9) Bluetooth has been enhanced from version 1.1 to 1.2 and now brings added functionality and greater connectivity speed to devices such as your Bluetooth Headset. 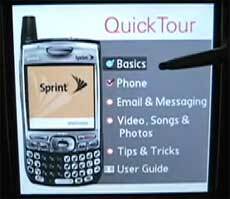 10) Sprint includes a small application that allows you to download some of the most popular Treo applications from their software store. 11) The first test of the incredible mobile data connectivity speed improvement that the Treo 700p is able to use thanks to its new EvDO radio comes when testing the Blazer browser – truly amazing how much faster it is to the Treo 650 as there is almost no delay in going from page to page. Blazer’s improved cache handling undoubtedly also helps to make it faster. 12) The old ‘Media’ application on the Treo 650 was extremely sluggish and this appears to have been _completely_ revamped on the Treo 700p with super fast image refresh rates. 13) As I wrote previously, the Treo 700p now supports 4GB and higher SD cards (8GB cards should be released in the fourth quarter this year) which is increasingly making it an even more attractive MP3 player. 14) Talking about MP3 players many Treonauts will be delighted to see that Palm has finally decided to use the fantastic standard Pocket Tunes player instead of the much maligned Real Player that was on board the Treo 650. 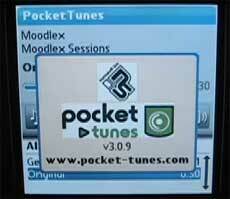 Streaming radio channels and WMA/PlaysForSure DRM protected music can also be used by upgrading to Pocket Tunes Deluxe. 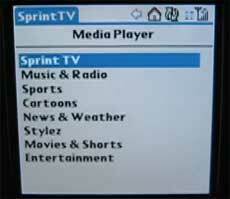 15) The Sprint TV application (which I believe is powered by MobiTV) has a wealth of channels across seven categories from Music & Radio to Entertainment with live and recorded programming. 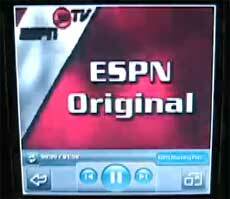 16) An intuitive and fast user interface allows you to quickly browse content within specific channels such as ESPN here. 17) The significantly enhanced speed that EvDO provides now makes both sound and video even clearer and more enjoyable on the Treo 700p. While some Treonauts have been complaining about the lack of WiFi on the Treo 700p I think that overall you’ll quickly agree that the other improvements that it provides make it a superb upgrade to the Treo 650. Most of the lucky few people that I have spoken to who already have a Treo 700p certainly agree. Even those that had abandoned the Treo in favour of another device are now certain that they will come back to the Treonauts fold with this new terrific addition to the Treo family. Finally, for those who are keenly awaiting news of a GSM version of the Treo 700p I can tell you from very good sources that although there have been some delays due to difficulties producing a model to handle simultaneous voice and data calls for Cingular’s high-speed HSPDA network we should see their model released within [Corrected] Q3 this year. What I want to know is whether it will be compatible with the palm wifi SD card adapter like the 700W. 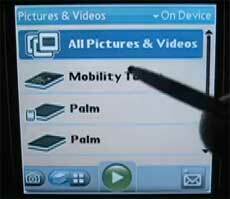 If it is its a must buy if not I'd like to see a model in 07 that is WiFi compatable and running palm OS. Verizon Wireless just announced that they'll start selling the beloved Treo 700p in a few weeks. I can't wait, I can't wait!!! "Finally, for those who are keenly awaiting news of a GSM version of the Treo 700p I can tell you from very good sources that although there have been some delays due to difficulties producing a model to handle simultaneous voice and data calls for Cingular’s high-speed HSPDA network we should see their model released within Q2 this year." Andrew, are you sure it will be out in Q2 this year? We only have about 45 days left in Q2. Perhaps you mean Palm's fiscal second quarter? 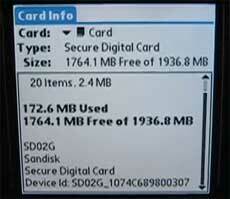 The 700p does not support WiFi via an SDIO card. I wonder if the USB speed is better than on the 650? It takes forever to synchronize with Media Player. I've noticed that the 700W with Verizon doesn't log text message conversations like the 600 and 650 do. Any idea if this will be the case with the 700p on Sprint? 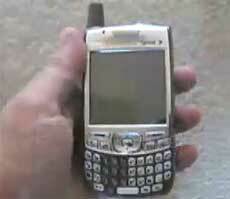 GSM Treo 700...I'll be waiting for you. Do anybody know wht the myTreo icon on the new 700p is for? Any latest update on the release of the 700p GSM? I will be waiting for some good intel on that. Z S, the 700p does indeed log text messages--even better, now it creates a thread of all SMS and MMS in a single application. 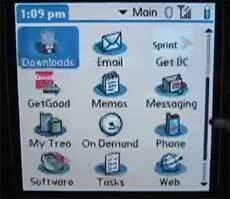 SvenR,the myTreo icon is actually an interactive instruction manual for all the features in the device. Rome - yes, I mistakenly wrote Q2 meaning Q3 for the release of the Cingular Treo 700p. i have been eagerly awaiting the 700p like many of us, and now trying to decide between Sprint and VZW. but i keep hearing about the GSM cingular version - sorry for the newbie q, but can someone explain briefly to me why this is so much better? I don't do much international travel, and I intend to buy from Sprint. What about this rumor that the GSM version will be thinner and with an internal antenna, i.e. the so-called "Hollywood" version? and perhaps some other improvements? if that's the case, it might be worth waiting another few (?) months. 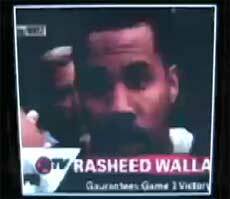 yea im gettin the treo on thursday...how should i upload videos to it, like what format should i use to get the best quality...and do you know if you can play yahoo games on the treo..